Welcome to our new grad students Carly Anderson (ChemEng) and Brandon Curtis (ChemEng). Congratulations to Dr. Joe Lee on his graduation! Matt and Connor attend the Clinton Global Initiative University annual meeting in St. Louis, where they discussed plasma disinfection with President Clinton and demonstrated a prototype device. 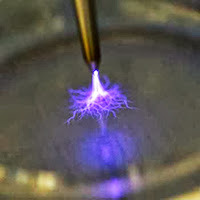 Learn more about the project to develop a low-cost, portable plasma disinfector. Welcome to our new visiting scholars Steve Park from Samsung and Toshi Ono from Tokyo Tech. Welcome to new visiting scholar from Comenius University, Slovakia, Prof. Zdenko Machala. Congratulations to Dr. Ting-Ying Chung on his graduation! Welcome to new visiting scholar from Hitachi, Takamasa Ichino.